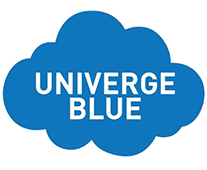 Hosted PBX or Cloud Based Telephone Systems combine the phone system equipment with the dial tones. You do not need to get phone lines from a separate company. There are many PROs and CONs with cloud based systems and this is the latest, most complicated, and most controversial type of service offered today. Many of the PROs and CONs are the same as with SIP trunks, both 1st and 3rd party, as Hosted PBX systems come in both 1st and 3rd party flavors. Cloud based systems offer some great features with a generally low entry price point. Many of the most advanced features including Automatic Call Distribution, Call Recording, Find Me / Follow Me, Simultaneous Ringing, Smart Phone Extensions, and more come at a very low cost compared with other types of systems. 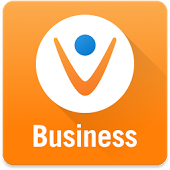 Depending on your Cloud Based Carrier, you can either use low cost generic SIP phones made by brands like Cisco, Polycom, Zyltus, Aastra, and more while some Cloud Based carriers like Toshiba VIPEdge and IPitomy also offer propriety phones with more features. Hosted Systems are location independent. You can take your phone home and plug it into the interest and use it just like you were at your desk. In fact, Cloud Based solutions essentially have complete disaster recovery plans built right in because with just some handsets you can be back up and running in a new location virtually instantly. The biggest CON is call quality isn’t always acceptable. Running voice over the Internet, regardless of how much bandwidth you have, sometimes results in poor sound quality, echoes, cut offs, and delays. Cloud based systems can be hard to use. You don’t have the normal line 1, line 2, line 3 button appearance that most people are used to. You have to transfer and park calls. You can’t just put calls on hold and pick them up at another desk. Long term cost of ownership can be much higher with Hosted telephone systems, but that depends on your specific set up. If you have lots of telephones, but not as many phone lines, you are generally not a good candidate for a Hosted system. If you have about the same number of telephones and telephone lines, then you are a good candidate. Just about all of the features of a cloud based system are available on traditional premise based systems and usually cost less in the long run. Cloud Based Systems require Cat5 cable for each phone, which may mean you have to do some wiring work in your office. Ideally, each phone would have it’s own Cat5 cable, but you can share a Cat5 cable with your computer, but that creates some network issues that can cause quality problems. Hosted PBX phones require power to the phones themselves. So you either need a power adapter for each phone, adding to desk clutter, or you need expensive Power Over Ethernet Switches. Cloud Based systems run over your computer network, so advanced network gear and knowledge is needed to keep these system running smoothly. Any failure in your network would also bring down your entire telephone system. Hosted Systems are not for the technically challenged. The phones are harder to use, the features are harder to use, and your network requires advanced management that usually requires an outside IT vendor to support, which can be very expensive. 3 lines, Speakerphone, Distinctive Ring, Large LCD display, Integrated Ethernet Switch, and more. 1 line, Speakerphone, Distinctive Ring, Large LCD display, Power over Ethernet, and more. 4 lines, Speakerphone, Distinctive Ring, Large LCD display, Power over Ethernet, Programmable Speed Dial and more. 2-Port GB Switch, 4 lines, Speakerphone, Distinctive Ring, 128 x 64 monochrome LCD display, PoE, Programmable Speed Dial and more. 5 lines, Speakerphone, Distinctive Ring, Backlit LCD display, PoE, Programmable Speed Dial, Wi-Fi Capability and more. The Polycom IP 335 is a two-line phone that offers a wide variety of features including HD voice, speed dialing, two Ethernet ports and power over Ethernet at an affordable price. The Polycom 335 has a modern backlit LCD display and a convenient speakerphone and handset combination. 3 lines, Full Duplex Speakerphone, Handsets and Headsets both Available, Power over Ethernet, Integrated Ethernet Switch, Distinctive Ring, Programmable Speed Dial, and more features. 4 Lines, Full Duplex Speakerphone, Handsets and Headsets both Availble, Power over Ethernet, Backlit LCD Display, Integrated Ethernet Switch, Distinctive Ring, Programmable Speed Dial, and more features. 6 Lines, Full Duplex Speakerphone, Handsets and Headsets both Available, Power over Ethernet, Backlit LCD Display, Integrated Ethernet Switch, Distinctive Ring, and Programmable Speed Dial. Full Duplex Speakerphone, Power over Ethernet, Backlit LCD Display, Integrated Ethernet Switch, Distinctive Ring, and Programmable Speed Dial. 6 Lines, Full Duplex Speakerphone, Handsets and Headsets both Available, Power over Ethernet, Integrated Ethernet Switch, Distinctive Ring, Programmable Speed Dial, and Backlit LCD Display. 6 Lines, Full Duplex Speakerphone, Handsets and Headsets both Available, Power over Ethernet, 2-Port Gigabit Ethernet Switch, Distinctive Ring, Programmable Speed Dial, and Backlit LCD Display. 12 Lines, Full Duplex Speakerphone, Handsets and Headsets both Available, Power over Ethernet, Integrated Ethernet Switch, Distinctive Ring, Programmable Speed Dial and Backlit Color LCD Display. 12 Lines, Full Duplex Speakerphone, Handsets and Headsets both Available, Power over Ethernet, 2-Port Gigabit Ethernet Switch, Distinctive Ring, Programmable Speed Dial and Backlit Color LCD Display. 12 Lines, Full Duplex Speakerphone, Handsets and Headsets both Available, Power over Ethernet, 2-Port Gigabit Ethernet Switch, Distinctive Ring, Programmable Speed Dial, Backlit Color LCD Display, Touch Screen and USB Expansion Ports. 16 Lines, Full Duplex Speakerphone, Handsets and Headsets both Available, Power over Ethernet, 2-Port Gigabit Ethernet Switch, Distinctive Ring, Programmable Speed Dial, Backlit Color LCD Display, Touch Screen, Bluetooth Compatibility and USB Expansion Ports. 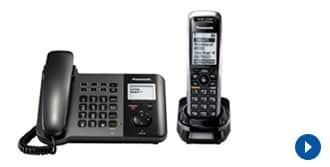 8 lines, Full Duplex Speakerphone, Backlit LCD Display, Cordless Handset and Corded Handset, Integrated Ethernet Switch, Connect up to 6 cordless handsets, Distinctive Ring available, Programmable Speed Dial, and more. 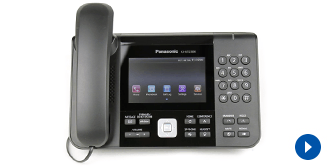 The Panasonic TGP 500 is a high-quality three-line phone featuring two Ethernet ports, speed dialing, HD voice, and a distinctive ring. The speakerphone/handset combination has a cordless option for ease of use, and the backlit LCD display makes this phone modern at an affordable price. 8 lines, Speakerphone, Cordless Handset, Distinctive Ring available, and Programmable Speed Dial. 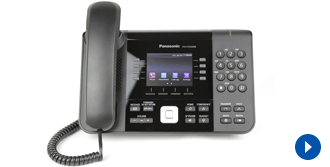 The enterprise-class Panasonic KX-UTG200 delivers enhanced functionality, productivity, and value to meet the communication demands of today’s business professionals. The KX-UTG200 is a four-line phone featuring two Ethernet ports, HD voice, full duplex speakerphones and a state-of-the-art color graphical display. Enterprise-class, 6-line phone with two Ethernet ports, HD voice, full 5-inch color LCD touchscreen, and built-in Bluetooth wireless technology. Ideal for today’s busy professionals. The user-friendly Yealink T20P is an HD two-line phone that offers a broad range of feature options, two Ethernet ports, and a speakerphone option. Users can quickly make calls with the intuitive function keys, and the device offers security protection for privacy. The feature-rich Yealink T41P delivers superb HD sound quality as well as a rich visual experience with programmable keys. It has a modern graphical LCD display for a rich visual experience and the ability to easily access dozens of VoIP features. The revolutionary Yealink T46G is the ideal HD phone with ten lines for busy professionals. With a sleek design and rich color display, this modern device supports Ethernet and a variety of device connections, while offering programmable keys so users can dial with ease. 5 Lines, Full Duplex Speakerphone, Power over Ethernet (IEEE 802.3af), Class 2, Programmable Speed Dial, Backlit LCD Display, and more. 1 line, Speakerphone, Cordless Handset (W52P base station required, sold separately), Power over Ethernet (IEEE 802.3af), Class 2, Programmable Speed Dial, Backlit LCD Display, and more features. 2 lines, Speakerphone, Distinctive Ring, RJ9 (4P4C headset port) PoE, Integrated Ethernet Switch, and more.